Flaxseeds are nutrient- and heart-healthy oil-packed seeds that are sold in several forms, including the oil pressed from the seeds. Although you can cook with whole flaxseeds and flaxseed meal, using flaxseed oil is not recommended. In fact, Dr. Sears of AskDrSears.com states that oils high in essential fatty acids, such as flaxseed oil, should not be heated heated because heat can turn the healthy fats into harmful ones. Add flaxseed to foods after they are cooked. If you grill, bake or sear meat you can add flaxseed oil onto the meat after it is finished cooking to increase the heart healthy benefits of that meal. Flaxseed oil can also be added to grains and vegetables after cooking. Add flaxseed meal to bread, cake, muffin, pancake, meatloaf or cookie recipes before baking. Using flaxseeds or flaxseed meal in cooking is superior to using flaxseed oil, according to Ask Dr Sears, because the seeds contain protein, fiber, vitamins B-1, B-2, vitamin C and vitamin E.
Drench bruschetta in flaxseed oil and roasted garlic. Bruschetta normally has butter and garlic or olive oil and garlic. Try replacing the butter with flaxseed oil, or mix flaxseed oil with olive oil to add to the bruschetta after its cooked. Add flaxseed oil to a protein shakes or to fresh vegetable juice. Mix protein powder, fresh berries, a banana, a serving of almonds, yogurt, low-fat milk and 1 tablespoon of flaxseed oil together to create a shake packed with omega-3 fatty acids, antioxidants, vitamins and minerals. If you are drinking fresh or pre-packaged vegetable juice, add a few teaspoons of flaxseed oil to the glass and mix well. The omega-3 fatty acids contained in flaxseeds and flaxseed oil are essential to human brain development and they also lower blood cholesterol, blood pressure and the risk of heart disease. Mix flaxseed into everyday condiments. Add flaxseed seeds or flaxseed oil to mayonnaise, ketchup, salad dressing or even drizzle over potato salad. You can also make pesto with flaxseed oil instead of olive oil or use it to dip French bread into. Make oil and vinegar dressing for your salad by using flaxseed oil instead of olive oil. Add flaxseed oil into soups or stews after cooking -- but not during. If you are making a large quantity of such a dish that won't all be consumed at one meal, add the oil to the bowls individually after you've served the soup or stew. This way you won't be heating the oil when you reheat the soup or stew the next day. 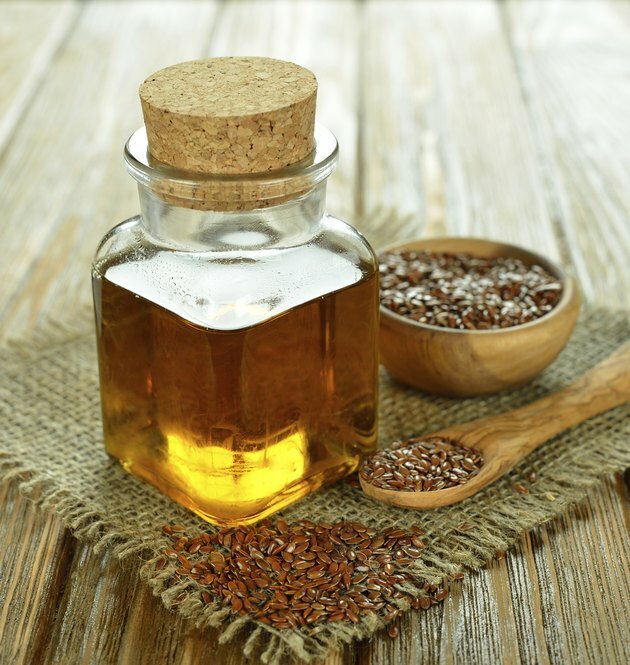 According to AskDrSears.com, flaxseed oil goes rancid quickly, as soon as six weeks after pressing; so it's best to purchase refrigerated flaxseed oil stored in opaque bottles. Pierce Whole Nutrition: Flax Seed -- Whole or Ground?